Reading and share top 4 famous quotes and sayings about Violent Language by famous authors and people. Browse top 4 famous quotes and sayings about Violent Language by most favorite authors. 1. 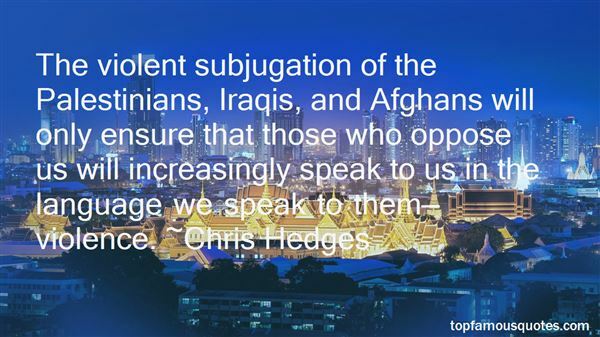 "The violent subjugation of the Palestinians, Iraqis, and Afghans will only ensure that those who oppose us will increasingly speak to us in the language we speak to them—violence." 2. "I passed a large dark room where a wall-mounted flat-screen with sound muted showed an overweight rapper performing rap hand gestures, which are supposed to project masculine cool but in fact look like a pointlessly violent version of deaf sign language." 3. "Violent ideologies speak their own language; core concepts are translated to maintain the system while appearing to support the people. Under carnism, for instance, democracy has become defined as having the freedom to choose among products that sicken our bodies and pollute our planet, rather than the freedom to eat our food and breathe our air without the risk of being poisoned. But violent ideologies are inherently undemocratic, as they rely on deception, secrecy, concentrated power, and coercion--all practices that are incompatible with a free society. 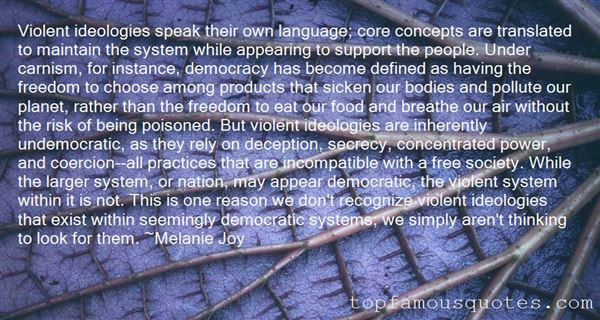 While the larger system, or nation, may appear democratic, the violent system within it is not. This is one reason we don't recognize violent ideologies that exist within seemingly democratic systems; we simply aren't thinking to look for them." 4. "As a child, I read because books–violent and not, blasphemous and not, terrifying and not–were the most loving and trustworthy things in my life. I read widely, and loved plenty of the classics so, yes, I recognized the domestic terrors faced by Louisa May Alcott's March sisters. But I became the kid chased by werewolves, vampires, and evil clowns in Stephen King's books. 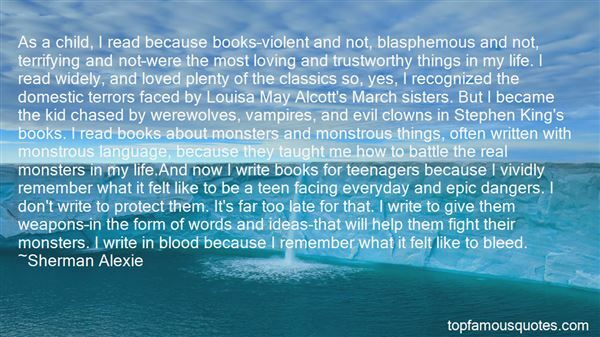 I read books about monsters and monstrous things, often written with monstrous language, because they taught me how to battle the real monsters in my life.And now I write books for teenagers because I vividly remember what it felt like to be a teen facing everyday and epic dangers. I don't write to protect them. It's far too late for that. I write to give them weapons–in the form of words and ideas-that will help them fight their monsters. I write in blood because I remember what it felt like to bleed." You know, I never should have let you not be my friend. It's not healthy for either of us."